Google recently made some changes in its page layout algorithm and therefore people might have noticed some changes in organic search traffic or rankings and also it might have impacted the websites which are having high ratio of ads to content at the top of the web pages. If you have such page layout in your websites then your site could be affected by this update of the Google page layout algorithm. Google's Matt Cutts tweeted saying that a refresh of the algorithm occurred on February 6 but he didn't reveal how much does this change impact on the web pages or any other information to this. 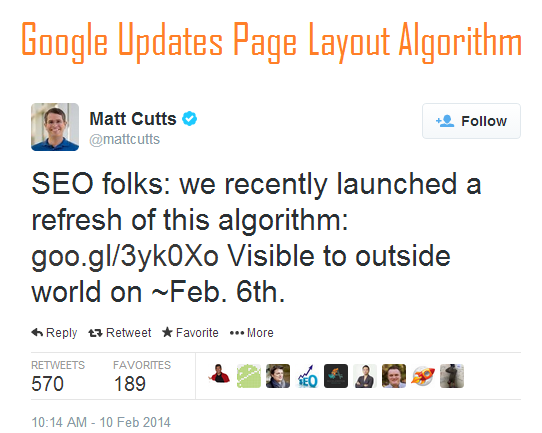 Last time Google added the page layout algorithm in January 2012, which they updated in October 2012. Which websites might get affected? This new update targets websites that are light on content and heavy on ads "above the fold". It says about the location where the part of the page visible to a user before scrolling. Cutts mentioned earlier also in his keynote that they were working on the next generation of the page layout algorithm, and specifically targeting sites that have large ads above the fold. He suggested that webmasters should make changes before the new algorithm impacted their sites. "If you look at the top part of your page and the very first thing you see front and center, top above the fold is ads right there, then you might want to ask yourself, 'do I have the best user experience?' Because we are working on an algorithm in the next iteration of that algorithm to try and catch some of that." Cutts said in October. The important thing is that it would have a bigger impact other languages (e.g., Russian or Arabic) more than it will English. People had a miss conception that it might affect websites that has endless scrolling technique, and often with a lot of white space and larger than normal font size but the trend has been moving to regular websites. How to check whether your site is affected or not? It is very important to find out whether your site has been impacted by the algorithmic refresh or not. You can check your analytics data to see if there’s any change occurring on or after February 6. As per Cutts, it's likely to be understood that major impact will be for webmasters with sites that aren't in English. Hope this change brings some good results for the sites having quality content with proper page layout defined.